Julie & Julia (2009). Poster design by BLT Communications, LLC. Production Companies: Columbia Pictures, Easy There Tiger Productions, Scott Rudin Productions. Two real life stories are added together in one film. Why do I not say: combined? Yes, well, the two stories are not from the same time. One story goes about Julia Child and the other one goes about Julie Powell. Julie Powell mentions Julia Child a lot and she hopes that Julia Child will come over to have a dinner, cooked by Julie à la Julia Child. So besides of that and besides of that in both stories it goes about the cookbook of Julia Child, they are not attached besides the book. 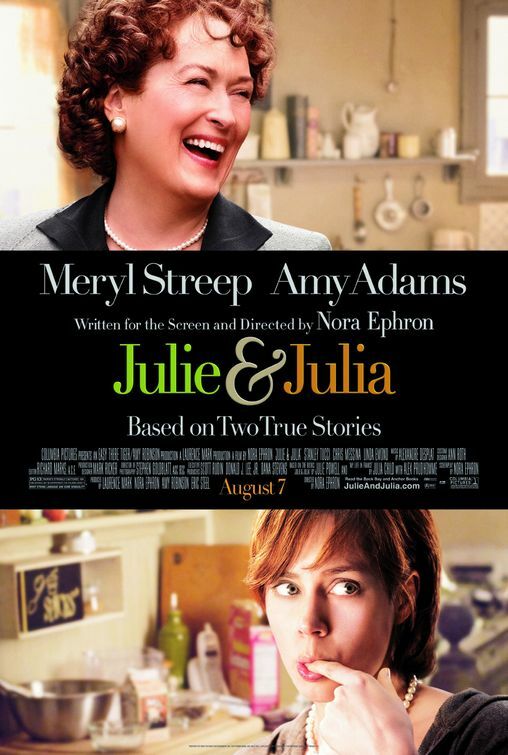 The film begins with Julia Child, an American who lives in France. Her husband asks her one day: “what is it what you really like to do?” , while the are having lunch in a restaurant, she answers: “Eat!”. And then it all begins…It is lovely to see how she is chasing her dream where she, possibly, is not sure of what it is exactly. She follows some lessons at the cooking school and she begins to understand the French language in cooking. She felt uncomfortable in the way the men of the cooking class looked on her when she was chopping the ingredients. But she loves cooking and is eager to learn all the basics. She starts practicing at home by chopping a lot of union. It is wonderful to see how much energy she stops in all. She gathers in the meantime a lot of recipes and then has the brilliant idea to make a book of it. It is hard work but again she manages it, together with two friends. She starts to give lessons in cooking and she gets her own cooking program on television from where she can teach everyone how to cook. This is also a point where the story of Julie Powell starts. An american woman who just moved to an apartment with her husband. She works at a, sort off, call center and helps people by listening to them or give them answers on the questions. She discovers she is a person that needs a goal in her life. Three girlfriends, where she was having a tea-party with, have already a big career, a lot of money and a prejudiced opinion towards Julie. Julie is seeking for something with a goal…and then she discovers: she has an opinion, everyone has, but she can also blog about it to give her opinions a place. Julie also runs the household so she wants to be a better cook. Watching a lot of television with her husband…Julia Child on television…yes then you have got the reason why these two stories are bound together. Julie Powell starts a blog, with a goal: 365 days in a year, 524 recipes of Julia Child in a year. Cooking through the whole Julia Child cookbook. When you watch this film, you recognize that you really love this film when you get the eager to be a better cook, have a wish to have once the book of Julia Child to learn you how to cook, and the film gets you thinking about your own goals in life. So, what is your goal this year in life?